Charles Morris' The Dawn of Innovation chronicles the first industrial revolution in the United States. In the first decades of the 19th century, America went from a largely rural economy, with little internal transportation infrastructure, to an industrial powerhouse. Morris details three uniquely American innovations--universal male suffrage, the shift of political power from the elites to the middle classes and the move to mechanized mass production--that resulted in the world's first democratic, middle class, mass consumption society. He starts his narrative in an unusual place--the Great Lake at the brink of the War of 1812. America and England are locked in a battle of oneupmanship, seeing who can build the biggest and most powerful fleet of ships to control the lakes. The wierd thisng is that the navies rarlely battle, due to a combination of weather, unfair advantage and conservative commanders. But the shipbuilding boom does set the stage for many innovations, including mass production of warships, that served as a precurser for industry changes that set the stage for the revolution. Morris crosses a wide range of industries in his journey--the role of steam engines in the mill waterworks in Lowell, Massachusetts, the global markets won by American gun makers, like Samuel Colt, building western steamboats to open midwest agriculture to new markets and mass produced clocks by Henry Shreve, which quickly took over the English market due to low cost and high reliability. Juliet Barker has written a book on Agincourt that's hard to put down--From Henry's clouded ascension to the English throne, through incredible domestic intrigues by others who believed the throne to be theirs, to border wars with those pesky Scots, to marshaling a thousand ships to get his army to France, and to winning a battle with exhausted and starving men against a French Army at least six times his size, the book never disappoints with insights and carefully researched facts that make it impossible to not stay up late reading. Henry V was a Master Logistician--No detail about preparing for the 1415 campaign in France to take back what he considered his rightful lands was overlooked by the King. He poured over account books with his paymasters, determining exactly who should be paid what for specific services. He determined how much weaponry, food, horses, support staff, clerics, wagons, etc. etc. would be needed to support his troops on the campaign. He argued with his armorers about how many and what type of arrows should be made and brought to France. He personally guaranteed all war debts with his own funds, lands and treasure. In sum, Henry made sure that he went into battle with an advantage--that being sufficient supply to keep his army well fed without raiding the local farms (and alienating his "subjects") and well equipped to move quickly on horseback across France (he brought more horses than men to France in 1415). Henry was a Military Genius--He made any archer who was proposed to join the campaign to pass a test--firing 10 arrows accurately in a minute--and left behind those that could not pass. Eventually, over 5000 archers were recruited, and then required to practice every Sunday for a year in advance. He stayed up late at night in France planning the next day's march or offensive with his knights. He out maneuvered and developed better battle strategies than the French for the entire campaign. (In truth, the French were basically leaderless and fighting among themselves when he invaded, but that was another aspect of his military genius). He scouted the Agincourt battlefield the night before and discovered that heavy rains would make it a quagmire for advancing French knights, making then easy targets for his archers and their armor piercing arrows. Henry was a Gifted Leader of Men--Henry consistently lead from the front, both in war preparations and in battle. He lead the council meetings for years before the war, planning where to land, how to secure their beach head, how to thwart French defenses, and his route of march to regain his "lost" territory in France. He oversaw the big picture strategy, but left the implementation to his knights and staff, but he constantly audited their operations to make sure things were being done to his satisfaction. He did not do "second best", spending extra to import the best gunners from Germany and the Netherlands to fire his artillery--a relatively new phenomena in medieval warfare. The book is full of useful leadership examples that can help an entrepreneur understand all the details involved in running a successful campaign--whether a war in France or a startup in 21st century America. Entrepreneurs have never had it easy. 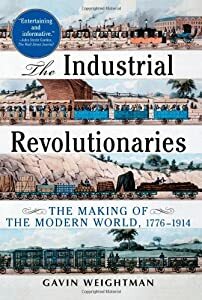 Gavin Weightman's fascinating journey (The Industrial Revolutionaries)on start ups from the Industrial Revolution into to early 1900's makes that very clear. Weightman traces entrepreneurial activity in Europe, America and Japan from 1776 until WW I, moving seamlessly between countries, inventions and people who helped make the world what we know it today. And one of the fascinating facts is that the earliest entrepreneurs, who put the world on the track to electric lighting, wireless telegraphy and automobiles often were the losers in the game. Who knew that Samuel Morse invented neither the telegraph or the "Morse" code? Morse, for example, was a fantastic marketer who co-opted others inventions as his own in the era of poorly written and unenforced patents across international boundaries. Other entrepreneurs simply copied inventions without innovation, such as the Japanese in the early 20th century. Perhaps the most interesting observation is Weightman's last one. In the Postscript, he observes that the grand master reporter of the Industrial Revolution, Adam Smith missed the boat on what was happening around him. For example,he was familiar with the steam engine, but never understood the importance of them in revolutionizing manufacturing. Such is also true today, in that no matter how smart we are, it is difficult to predict how innovations will change our lives. I guess that's just part of our human experience. Is it really worth reading a book on Warren Buffett's management style written by his daughter-in-law? The short answer is yes. Warren Buffett's Management Secrets is short, to the point and useful. Much of what drives Buffett's business success is common sense and the discipline to follow that common sense. Many of us fail in either one or both of those attributes at times in our own entrepreneurial or investing processes. So it is good to pick this book up periodically to remind oneself of how to stay on the straight and narrow path to success. Pick the Right Business (and Business Model)--I see many good ideas from entrepreneurs that lack a solid money making business model. You need the right economics in any business to ensure long term sustainability and most important, high market valuations. Delegate Authority (and Choose the Best Employees)--There is no way a founder can "run" an entire business, but that's what many try and do. Getting the right team in place, making sure they are correctly motivated and resourced and delegating responsibility to make it happen are what I look for in an entrepreneur. Good companies fail every day due to poor hiring and poor delegation decisions. Find a Manager with the Right Qualities--Warren looks for integrity, intelligence and a passion for the business when choosing companies to purchase or new leaders for his current companies. The recent David Sokol debacle around insider trading in Berkshire Hathaway shows the importance of questioning all hires about their ethics, especially if they end up quitting and going to work for a competitor. Motivate Your Workforce--Warren has adapted and improved on Dale Carnegie's methods for motivating people. These tools have been somewhat forgotten today in the world of new age management, but hold many useful lessons that can help establish a positive and well-motivated work force. You cannot be successful without having others believe in what your are doing with benefit them as much as it will benefit you. Focusing on Key Managerial Axioms--The book ends by dwelling on around ten key managerial axioms that Warren lives by. For example, learning from your mistakes instead of ignoring the potential lessons and moving on, or banking on the tried and true, or the dangers of borrowed money, etc. These are worth incorporating into daily business management, not only for the entrepreneur but also for his fellow travelers. The book has much deeper insights than I have presented here. I found myself agreeing with many of his insights and thinking about how I would look at business differently as a result. You can read the book on a short plane trip. Five Stars***** rating from Dave. Brad Feld and Jason Mendelson's best seller Venture Deals-Be Smarter than your Lawyer and Venture Capitalist is the best book written so far on the subject of how an entrepreneur can survive the start up fund raising world with their dignity and perhaps their company intact. If you are an entrepreneur, or plan to be one, buy and memorize this book. I am a big fan of Michael Lewis' writing, starting with Liar's Poker in the late 1980's, The New, New Thing and Money Ball in the early 2000's. And The Big Short is perhaps the best book he has ever written. If you want to understand what happened to Wall Street and our economy over the last decade, then his book is the place to start. It is people that ultimately make the good and bad decisions about creating and selling financial instruments and the best and brightest were mostly on the sidelines (thanks, Alan Greenspan) when the creation of credit default swaps (CDSs) and Collateralized Debt Obligations (CDOs) proliferated and became the downfall of finance as we knew it. Lewis does a superb job of following the fortunes of people on both sides of the trade--those on Wall Street who were creating these repackaged sub prime mortgages and those hedge funds and individuals who were betting against them. His narrative goes back and forth between the money hungry investment bankers who can't create the junk fast enough, the rating agencies who get convinced that this is all triple A rated debt, AIG who cannot insure the junk fast enough and a small group of contrarians who make massive bets against these new financial instruments (hence the title, The Big Short). You get to see all sides of the story in living color and gory detail. The amazing part is the end when the bubble has burst and the shorts win. They do not feel victory or become heroes, having just witnessed the near collapse of the world financial systems. Sure, they made a lot of money but none seem very happy about it and either do their investors. A weird and tragic ending, since the whole story has yet to play out. FIVE STARS OUT OF FIVE...but depressing. David Liss' superb first novel, A Conspiracy of Paper, reaches back to London in the 1700s to wrap a mystery around the simultaneous emergence of venture capital and stock exchanges. One of the few people ever to turn a PhD thesis into a best selling book, Liss explores the criminal underbelly of the new world of exotic venture companies( The South Sea Company, for example) and the competition with the Bank of England for control of the English financial system. All the usual suspects are in place--the hated and rich Jews, corrupt "stock jobbers", murky CEOs, minions often bribed for favors, criminal gangs and best of all, the gullible royalty. This is a well written thriller that appealed both to the mystery lover in me as well as the venture guy. I found myself saying, " what a dumb presentation--I'd never fund that dog" and "what are these dopey investors thinking??" Lots of fun, enough history to make it all believable and a good dose of realistic London life in the 1700s--not very pretty, where life was cheap and hanging was the usual penalty for most any offense by the lower classes. 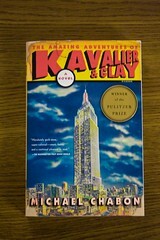 Anyone interested in a fascinating account of the (fictionalized, but real in many ways) lives of entrepreneurs should pick up a copy of the Pulitzer Prize winner, The Amazing Adventures of Kavalier & Clay by Michael Chabon. Set in the 1930's, Kavalier and Clay are two cousins, one with a talent for drawing and one with writing skills, combine their talents to produce superhero comic books. I know, the story line sounds corny, but trust me it is not. The are signed to a "lifetime" contract of servitude by a trashy publisher, who owns all their good ideas for years before they break out of the deal. The trashy publisher makes millions on them, but pays them only thousands, in spite of their many attempts to get out of the deal. Throw in the Jewish diaspora from Europe, crazed Nazi supporters in the US trying to do them in, attempts to rescue family from certain death in Europe, expeditions to Antarctica, sprinkled throughout with the pursuit of magic and you have a fascinating, extremely well written, hard to put down story. There are numerous lessons for entrepreneurs scattered throughout the book--such as make sure your lawyers read all contracts you sign, the "right" kind of personal sacrifices to make in pursuing your entrepreneurial dreams, how real life can easily get in the way of success, how and why rewards may need to be put off for many years, etc., etc. The Amazing Adventures of Kavalier & Clay is a highly recommended book for budding entrepreneurs who want a taste of "living the entrepreneurial dream" before actually doing it. 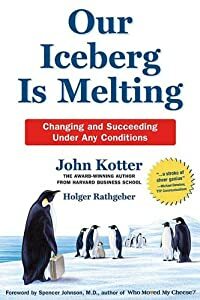 I may be the last person in the business world to read John Kotter's Our Iceberg is Melting. I usually avoid parables and fables couched as business books. But I was asked to read the book as part of an ongoing transformation at one of the non-profits we consult with on a regular basis. And I am a convert to how the book can be very useful to start-ups, successful companies, non-profits and even your own life. First, it's short and to the point. My wife read the book to me in a recent drive from our home in Maine to a meeting in Boston, about a one and one-half hour drive. Yes, my wife reads to me often in the car. We both enjoy it. We both found the book entertaining and educational at the same time. We often stopped reading and guessed at how some of the main "characters" (the penguins) would behave in various situations. We ended up having a lively discussion at dinner before the meeting about the messages in the book. No business book has ever created so much interest and dialogue for us. Second, it's all about involvement and communications, stupid. One of the major failings I see in companies and relationships is the inability to draw affected people into a decision process and using everyone's input to craft a solution. The book describes in detail both how to do this and what issues one may encounter in the process. No one likes change. Period. And Kotter speaks in detail how best to get people to accept and even embrace change. Third, we all better listen to the lessons. Our world is constantly changing as is our relationships with our friends and loved ones. Embracing the ability to change and having a process to adapt is crucial to our survival. Remember that we are all here because our ancestors were the ones that embraced change and survived. We need to keep learning that lesson in our organizations and personal lives. Finally, we have the opportunity to change. I don't care how rich you are and can avoid change, or how you think you might be isolated from the huge changes that our going on in our world. You aren't. Stupid as it may sound, there is opportunity in crisis. In the world of start-ups, for example, all the old paradigms on building a successful company are obsolete. Take the current opportunity to change as your chance to redefine your business model before it is too late. For $12 or so on Amazon, this is the cheapest advice you can get on how to be successful in life and business. I have been a fan of Blueprint to a Billion by David G. Thomson since the book was published. Executives in most of my portfolio companies have read the book and applied many of the principles. No billion dollar exits yet for Dave, but there's always hope. There have been a number of knock-off books since, but none that really improved on the original. Until Tuned In by Craig, Stull, Phil Myers and David Scott, that is. Many of you probably know the basic premises of BTB, as its known in the entrepreneurial world. Create a breakthrough value proposition, go after high-growth markets, get marquee customers, leverage alliances, master exponential returns, adopt inside-outside leadership, and find good board members summarizes the lessons nicely. Easy to say and miserably hard to implement. That's where Tuned In comes in. Creating and sustaining a breakthrough value proposition is the first "essential" in BTB and the one most companies find the most difficult to accomplish. Tuned In lays out a six step, "Tuned In" process which an entrepreneur can follow to achieve Essential #1 in the BTB world. Find unresolved problems, understand buyer persona's, quantify the business case, create breakthrough experiences, articulate powerful ideas, and establish authentic connections are the basic messages. Not a lot of new ideas here, but a nice, detailed path the help the entrepreneur get their arms around task #1 in a start up--pursuing the right idea. More information on how to apply the process in an innovative manner is needed. Some of the text rehashes old ways of doing business, rather than how to participate in the next revolution. For example, thoughts on how small business people could take advantage of the emerging mobile web would make the book more useful. But I quibble too much. Like all good business books, the Tuned In authors use a number of relevant case studies to make their points. These are often the highlight of the chapters as they describe what works and what doesn't in executing the process. I particularly liked the thoughts around crafting "elevator pitches" in Chapter 8, focusing on articulating powerful ideas in simple terms, the Achilles heal of many entrepreneurs. Buy both if you have not read them and make that six hour flight to San Francisco a little more productive.